The WPP Extreme Blog Makeover + One-Year Blogiversay Giveaway!! Enter HERE! 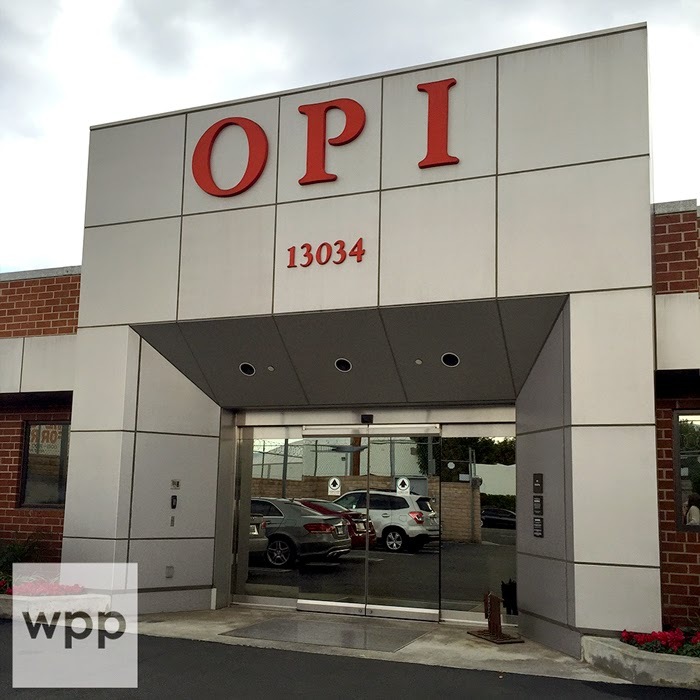 New and Improved work / play / polish (WPP)! It's also my one-year Blogiversay. So I'm celebrating with my biggest giveaway ever!! Keep reading for details! I've worked so hard on this new site for so long - it's exciting to finally see it alive and kicking. To celebrate this extreme blog makeover, I'm hosting a giveaway with GREAT prizes. And not coincidentally, the giveaway ends on May 6th - my one year blogiversary!! It's been an amazing year and I wouldn't be here without my awesome readers. So thank you!! I have a few other special bloggers to thank, but I'll save it for the end of this post. Let's get to the giveaway! All of these prizes are meaningful to me and my blogging journey this past year. THE COMPLETE RUBY WING SCENTED SPRING GARDEN COLLECTION! A SET OF EIGHT (8) FULL SIZE SHIMMER POLISHES! THE ENTIRE JESSE'S GIRL FROSTED GUM DROPS COLLECTION! A BUNDLE OF VIVID LACQUER CUSTOM STAMPING PLATES! ZOYA SUMMER COLLECTIONS-STUNNING AND IRRESISTIBLE! 5 WINNERS! 2 COLLECTIONS EACH! THE FULL ZOYA SUMMER STUNNING COLLECTION! The Ruby Wing Festival Paint Collection showed up at my house before there was even a peep about it online. If you’re a nail polish blogger – that’s a heart racing moment! SolarActive makes the stuff that makes Ruby Wing (and lots of other cool products) change colors in the sun. SolarActive is providing the complete Ruby Wing 2013 Scented Spring Garden Collection! Shimmer Polish makes beautiful, fine glitter bombs! My sister ordered Shimmer Leslie for me as a surprise. In her order, she just happened to mention WPP (my sister’s a genius)! The package arrived with my bottle of Leslie along with an astonishing batch of polish to review! I made a few squealing phone calls that day! 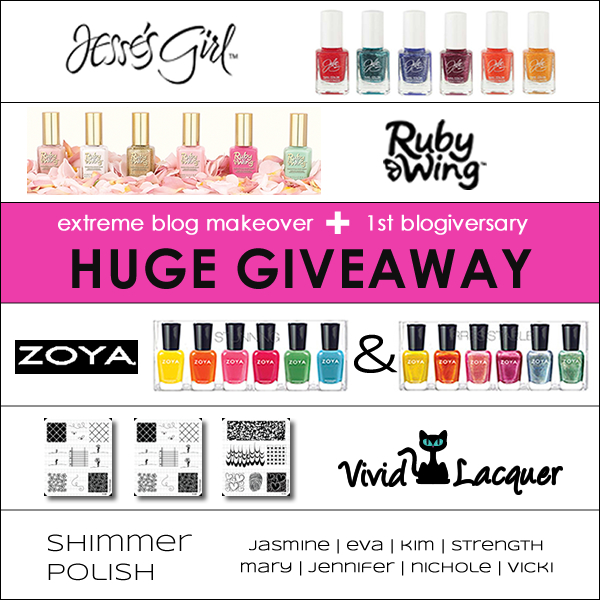 Shimmer is sponsoring eight (8) polishes in this giveaway! My Jesse’s Girl Cosmetics JulieG Frosted Gum Drops display photo was the highlight of my first year as a nail blogger. What a remarkable opportunity! My collection announcement post holds the record for views in a single day. It will be hard to beat! Thanks to Jesse’s Girl, you can win the entire Collection of Frosted Gum Drops! I contacted Anni at Vivid Lacquer when WPP was just a baby and she sent me the first polish I ever reviewed! Her polish is divine but her secret weapon is her custom stamping plates. The best! Vivid Lacquer has sponsored a bundle of three awesome plates (VL006, VL008 and VL009) for this giveaway. In a giveaway about my first year, I have to include Zoya…they have an incredible blogger network and were the first big brand to give WPP a chance. Plus, I looooove their polish. Zoya is generously offering 5 WINNERS this huge which prize includes a Zoya 2013 Summer Release Duo...BOTH the Stunning & Irresistible Collections. There are lots of ways to enter. 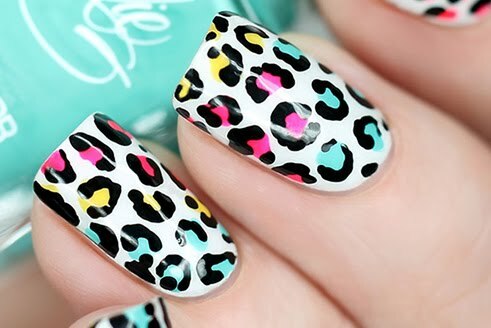 First, "Like" WPP, Vivid Lacquer, Jesse's Girl Cosmetics, Shimmer Polish and SolarActive on facebook. After that, you can pick and choose what additional entries you'd like to do...from super easy (answer a multiple choice question you can't get wrong) to adventurous (go on a scavenger hunt and gain 10 entries for finding and photographing the JulieG Frosted Gum Drops display in any Rite Aid). Official Rules are listed in the Terms & Conditions at the end of the Rafflecopter widget. Prizes can only be shipped within the United States (US). No PO Boxes. International entries are accepted provided you have a valid US shipping address. If you've managed to read down this far, thank you! I've made so many friends over the last year. I encourage anyone looking to start a blog to reach out to your fellow bloggers. You can't find success in a vacuum and the WPP momentum didn't really begin until I started to network. So as I reflect on the last 12 months, I'd like to mention a few bloggers who made a huge impression on me this past year. Some of them may not even know it! Victoria at the Manicurator: She's my blogging BFF and sensei and I learn something new from her every day. Not only is she super talented...I count her among my closest friends. I wouldn't have made it a year without her. Together...we're dangerous! 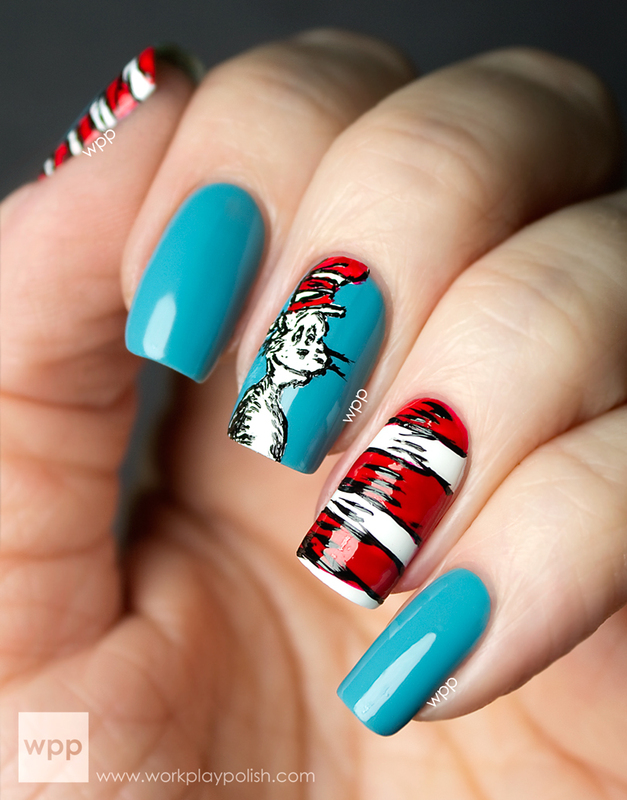 Susan at The Silver Nail: I love her sense of humor, point of view and awesome nail news...but most of all I love her absolutely selfless spirit. It makes my day when an email from Susan pops up in my inbox! Yvonne at Hey Do You! : Yvonne is a social media maven with professional PR experience and a long blogging career. She's taken the time to give me priceless advice when she didn't have to!! I'm so lucky to have crossed paths with her! Sophie at My Awesome Beauty: My first and only guest post was on My Awesome Beauty. Even now I can't believe Sophie asked me! She's an amazing photographer and blogger - in fact, she's the Beauty Blogger of the Year in Norway! Radha at The Polish Owl: She'll probably be shocked to see her name here. But early on...she really promoted me. At the time, I didn't even know how to work Twitter so it wasn't until much later that I realized how generous she had been. Plus her swatches are gorgeous!